The question always comes up as soon as people find out I’m from Pennsylvania: Why did you move to California? The answer, of course, is not nearly as dramatic as people hope for. My journey to an advertising career in California has taught me that things won’t always be easy, but they will be worth it. I grew up in Avondale, Pennsylvania, a small town outside of Philadelphia known for mushroom farms and not much else. I loved growing up in PA; you are halfway between NYC and DC. You can get to the beach within an hour, go tax free shopping in Delaware, eat amazing hoagies, and enjoy the beauty of the Pennsylvania wilderness. When it came time for college, I decided to attend one of the best state schools, Penn State University. Like many people in advertising, I started on a creative path. I always wanted to be an artist and was accepted into the graphic design program at Penn State. Around my sophomore year I realized I was not as passionate about design as my classmates. I felt like I wanted something different but still tied to the creative field. Advertising was a great fit. I remained in the art program at Penn State, double majoring in advertising and integrative arts with a focus on photography and graphic design. Despite being a mouthful, I found the perfect majors for me. I was learning the fundamentals of creative elements within advertising but dove fully into the strategic side. I was beginning to see that advertising was all about finding creative solutions to problems. I also found that I liked to be in the middle of it all, I worked best coordinating teams and being the point person, hence account management was for me. After setting account management as my goal, I worked various account internships, all in Philadelphia. There aren’t many ad agencies in small town Pennsylvania, so Philly was the place to work every summer. I got experience on several pharmaceutical, energy company, and retail accounts. While finishing up my last internship in Philadelphia, I had a meeting with one of the account supervisors. I spoke to her about my plan for the future. Unfortunately, there were no open positions at the agency and it was time for me to move on. Philadelphia was a great place to get ad experience but I didn’t really see any agencies working with brands that I felt passionate about. I knew I wanted to be in a big advertising city like New York, Los Angeles, or Chicago. They have some of the best agencies and incredible clients. It was easy to narrow those cities down for me. New York City? Great place to visit but after being dragged there any time a relative visited from England or on any number of school trips, the magic of the city was lost for me. I just saw a hustle and bustle that I didn’t connect with. Chicago? Too cold, after four harsh winters in the mountains of central Pennsylvania at Penn State, I was not ready for the “Windy City.” So, Los Angeles it was. In the same meeting with the senior account manager, I mentioned my desire to work in LA. Whether it was true or not, she told me to be successful in LA you must start your career there. Over the years I’ve worked with plenty of people who have proven that statement wrong. However, this was the push I needed at the time. It was no more, “I’ll start looking in a few months” or “I’d like to try LA.” I hit the ground running applying to any open position I could find at LA ad agencies. I instantly found that it’s quite hard to get a job when you are on the opposite coast. Everyone sees your address and thinks you are just another college grad with a big dream who will probably not make the move. I wanted a job set up before I moved, but every company wanted me to move before I had a chance at a job. After what seemed like a thousand rejections, I stepped up my networking. I connected with alumni in the Greater Los Angeles Area on LinkedIn, asking how they got started and if they had tips for me. I also questioned everyone and anyone I met, looking for any connections in LA. Finally, I found a thread. A friend of a friend from Penn State was currently interning at an agency in Santa Monica and she was able to get me an interview. The Skype interview went great, but of course the question of when I was moving to California came up. Without hesitation I said, “two weeks from today!” Three hours after the interview, I received an email from HR saying I landed the internship. I had two weeks to pack my life into a suitcase, find a place to live, and get on a plane to LA. 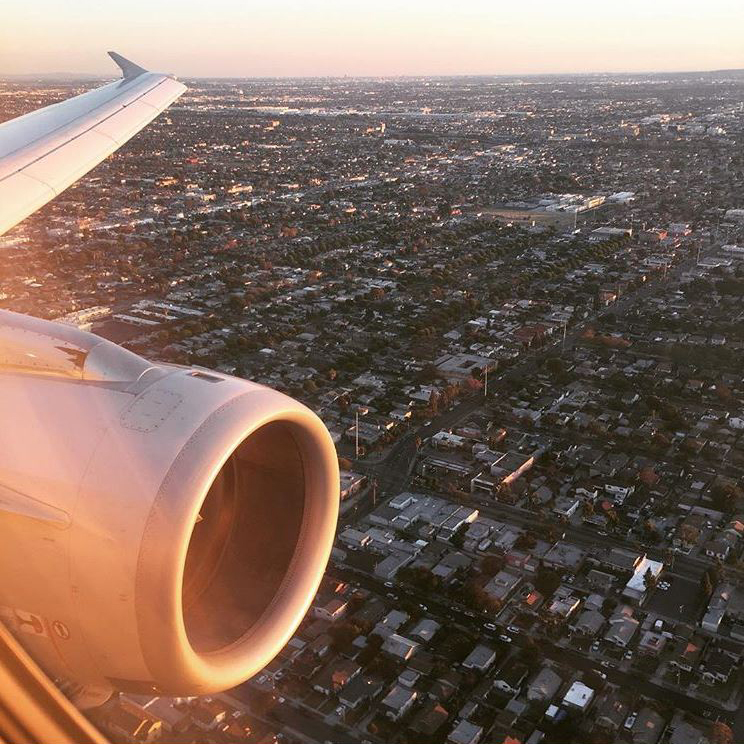 In the iconic words of Miley Cyrus, “I hopped off the plane at LAX with a dream and my cardigan.” My first year in LA was full of ups and downs. I lived in a one-bedroom apartment with three people. My car was broken into and my bike was stolen. I was 3,000+ miles from family and friends. However, my internship soon turned into a full-time job and was I working on national advertising for a major car brand learning as much as I possibly could. Before I knew it, I had been at my job for a little over a year. My supervisor offered me a spot in the IAAS of Southern California 4A’s 14-week program at UCLA. I was grouped with young professionals from various agencies, taking classes about the industry and working on an extensive mock new business pitch. Through this experience, I saw the incredible minds working in advertising and the amazing projects happening. I knew advertising was where I wanted to be. After two and half years in LA I was ready for a change. I loved the agency I was working at but wanted to get experience on brands outside of automotive. I looked north and south, and then turned toward Orange County. I knew there were some great agencies there and I found the perfect fit with Amusement Park. AP is an agency that sticks to their values while creating great work for clients. Every day isn’t easy but I’ve found a new home in Orange County and a new family at Amusement Park.